The Common Mussel is a blue-black coloured bivalve with a shell up to 10 cm (4 in.) long , usually found clumping together on wave-washed rocks ,often occurring in extensive beds . Few individuals survive more than 2-3 years due to intense predation. 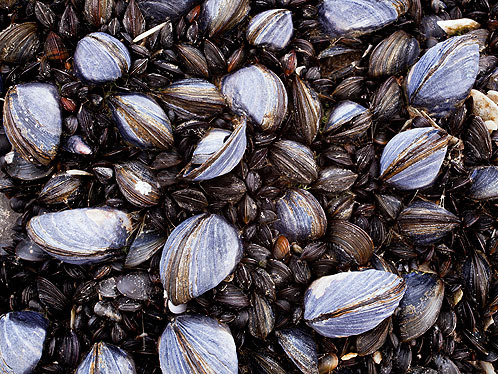 Mussels are suspension feeders, filtering seawater for detritus and phytoplankton (microscopic marine plants). Mussels tend to group together and create ‘mussel beds’, providing them with a stronger anchor to the seafloor and protection from predators such as starfish, crabs and oystercatchers . They are not without defence against their main predator the dog whelk. The mussels produce byssus threads (strong, silky fibers made from proteins) , which they attach to the marauding whelk. Several mussels work together to attach enough threads to pull the whelk over onto its side so it can’t feed on them. Mussels are gonochoristic, with separate male and female individuals. Most marine mussels reproduce by spawning into the water column, where fertilization and larval development occur . These larvae flow with the changing tides until they find a suitable substrate to which they can attach.